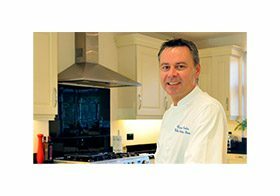 Price Kitchens have over 35 years’ experience in designing, manufacturing and fitting luxury kitchens right across London and Surrey. We are so much more than your average chain store kitchen company and offer a truly personal service aimed to give you the dream kitchen you have always wanted. When it comes to choosing the design, materials and appliances for your kitchen, nothing should be left to chance. The kitchen is so often the heart of the home whether it gets used for big family meals, or as a stylish setting for drinks in a sleek city flat, it will always be a focal point of the home. 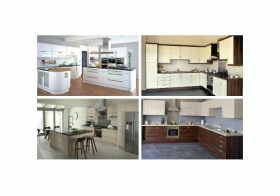 By choosing the right kitchen company you are making sure your room is perfect in every way and gives you pleasure for many years to come as well as adding value to your property. Price kitchens are a family run company and have the experience and knowledge needed to make sure you get the right type of kitchen and also the right appliances for your lifestyle and needs. Our showroom in Croydon is filled with examples of kitchens to inspire you and highlight the vast range of materials, styles and possible layouts a kitchen can include. We offer a free design consultation service where you are given the time and care needed to make sure your dream kitchen starts as it should do; with a professional and bespoke design. Using the most up to date CAD systems our highly skilled team will pull together your thoughts, ideas and tastes and produce a design you can start looking forward to seeing in your home. We manufacture our kitchens in house which means we are able to change and adapt them to fit your home and your needs. The kitchen can mean different things to different people and it is important you are given the time and care needed to understand your requirements and turn them into a beautiful and functioning kitchen. As with design, getting the right appliances can turn a normal kitchen into a dream kitchen. By making sure you understand the technology and by offering nothing but the best kitchen appliance brands we make sure your kitchen has all the mod cons it needs. This process often involves us showing customers brand new technology like wireless phone charging surfaces and built in speakers as well as more traditional essentials like hob tops and ovens. Making the right choice of kitchen appliance can mean years of happy cooking and entertaining. Making the wrong choice or opting for poor quality appliances can mean years of annoyance and cost. Price Kitchens work with a number of high end appliance brands like Neff and AEG to make sure you only get the best and your dream design is backed up with reliable and cutting edge appliances. Price Kitchens offer a wide range of kitchen types and materials. This includes a huge range of finishes and design touches. Choosing the right surfaces for worktops and breakfast bars in a kitchen is critical. Whether you are constantly cooking and entertaining or your kitchen is more of a room for a Sunday paper and coffee, the materials should be suited to the use. Certain surfaces offer more stain and wear resistance, others can be less tough but deliver sumptuous finishes. 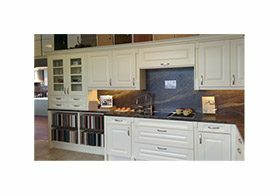 Price Kitchens can supply wood, granite and other surfaces like Corian to fit beautifully with natural finish oak doors, or painted wood cabinets for a traditional feel kitchen. Or how about a contemporary gloss finish kitchen to bring a modern feel to your home? 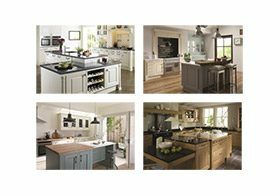 Whatever your tastes the price kitchen team will make sure you get the right advice and a design and installation service that is second to none when it comes to quality, value and reliability. 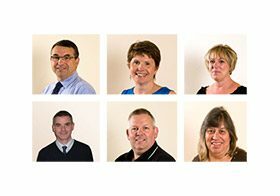 Visit our showroom today and our friendly team will make sure you get the service you deserve. You can also view our retail kitchen case study for ideas. As a family business we take each and every customer’s ideas and needs very seriously, unlike many chain suppliers we deliver a truly tailored service as well as one that is hard to beat on price. For more information, contact us today by telephone on 020 8686 9006 or fill out the form below. Thank you for all your help transforming our kitchen. Claire, without all your patience, I am sure I will still have the kitchen that your father installed 32 years ago. Dan was always a delight to deal with and is a real credit to your company. Although we have not met Dawn, I should imagine that she is an amazing person to have behind the scenes. Chris was brilliant, he worked so hard and nothing was ever too much for him.